The ImportSqoop processor allows loading data from a relational system into HDFS. This document discusses the setup required to use this processor. The DB Connection password section will have the name of the key derived from the controller service name in NiFi. In the above snippet, the controller service name is called sqoop-mysql-connection. Sqoop requires the JDBC drivers for the specific database server in order to transfer data. The processor has been tested on MySQL, Oracle, Teradata and SQL Server databases, using Sqoop v1.4.6. The drivers need to be downloaded, and the .jar files must be copied over to Sqoop’s /lib directory. As an example, consider that the MySQL driver is downloaded and available in a file named: mysql-connector-java.jar. This would have to be copied over into Sqoop’s /lib directory, which may be in a location similar to: /usr/hdp/current/sqoop-client/lib. The driver class can then be referred to in the property Source Driver in StandardSqoopConnectionService controller service configuration. For example: com.mysql.jdbc.Driver. Avoid providing the driver class name in the controller service configuration. Sqoop will try to infer the best connector and driver for the transfer on the basis of the Source Connection String property configured for StandardSqoopConnectionService controller service. The above utility will output a base64 encoded encrypted password, which can be entered directly in the controller service configuration via the SourcePassword and Source Password Passphrase properties (mode 2). Say, the file containing encrypted password is named: /user/home/sec-pwd.enc. Put this file in HDFS and secure it by restricting permissions to be only read by nifi user. Provide the file location and passphrase via the Source Password File and Source Password Passphrase properties in the StandardSqoopConnectionService controller service configuration. During the processor execution, password will be decrypted for modes 2 and 3, and used for connecting to the source system. In Kylo, the TriggerFeed Processor allows feeds to be configured in such a way that a feed depending upon other feeds is automatically triggered when the dependent feed(s) complete successfully. 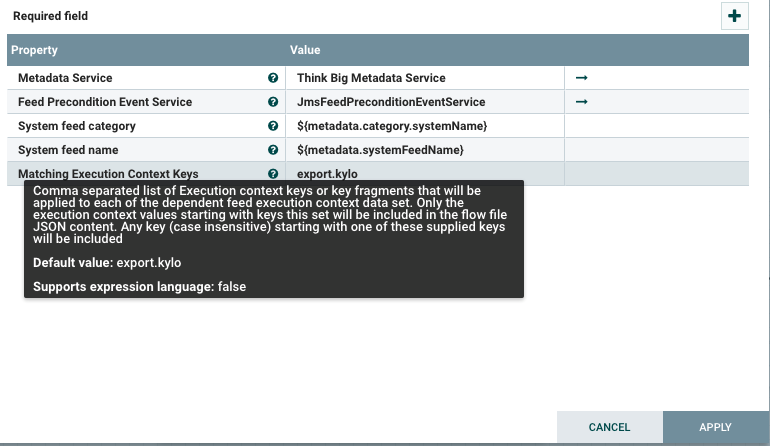 To get dependent feed execution context data, specify the keys that you are looking for. This is done through the “Matching Execution Context Keys” property. The dependent feed execution context will only be populated the specified matching keys. Feed_B depends on Feed A and has a Trigger Feed that has “Matching Execution Context Keys” set to “property”. The screenshot shown here is an example of a flow in which the inspection of the payload triggers dependent feed data. The EvaluateJSONPath processor is used to extract JSON content from the flow file. The high-water mark processors are used to manage one or more high-water marks for a feed. High-water marks support incremental batch processing by storing the highest value of an increasing field in the source records (such as a timestamp or record number) so that subsequent batches can pick up where the previous one left off. There are two water mark processors: LoadHighWaterMark and ReleaseHighWaterMark. The section of a NiFi flow where a water mark becomes active is starts when a flow file passes through a LoadHighWaterMark processor and ends when it passes through a ReleaseHighWaterMark. After a flow file passes through a LoadHighWaterMark processor there must be a ReleaseHighWaterMark present to release that water mark somewhere along every possible subsequent route in the flow. This processor is used, when a flow files is created by it or passes through it, to load the value of a single high-water mark for the feed and to store that value in a particular attribute in the flow file. It also marks that water mark as active; preventing other flow files from passing through this processor until the active water mark is released (committed or rolled back.) It is up to other processors in the flow to make use of the water mark value stored in the flow file and to update it to some new high-water value as data is successfully processed. This processor is used to either commit or reject the latest high-water value of a water mark (or the values of all water marks) for a feed, and to release that water mark so that other flow files can activate it and make use of the latest high-water value in their incremental processing. Since other flow files are blocked from entering the section of the flow while the current flow file is using the active water mark, it is very important to make sure that ever possible path a flow may take after passing through a LoadHighWaterMark processor also passes through a ReleaseHighWaterMark processor. For the successful path it should pass through a ReleaseHighWaterMark processor in Commit mode, and any failure paths should pass through ReleaseHighWaterMark processor in Reject mode. It is also necessary for some processor in the flow to have updated the water mark attribute value in the flow file to the latest high-water value reached during data processing. Whatever that value happens to be is written to the feed’s metadata when it is committed by ReleaseHighWaterMark. If at step #1 the LoadHighWaterMark processor sees that the water mark is already active for a prior flow file then processing is delayed by yielding the processor. If processing failure occurs anytime after step #1 then the flow would route through a different ReleaseHighWaterMark processor configured to reject any updates to the water mark attribute and simply release the active state of the water mark.